After the Brexit referendum the general response on the continent and in mainstream media was unanimous. Brexiters have been portrayed as the bad guys that selfishly departed from the European Union. Shock that followed the Brexit vote was unprecedented and questioned the sole existence of the EU. Current chaotic UK government’s negotiations on the UK’s exit from the EU and related uncertainty will have unprecedented effects on the entire continent and has unleashed a deep institutional crisis of the European Union. Modern game theory and the economic theory of federalism may explain the causes of this crisis and also the economic impacts of the Brexit for the future of the European Union. The paper presents the game theoretical explanation for the Brexit and offers a set of the economic criteria that may be used by the EU policy-makers in order to mitigate the current crisis and to construct an efficient institutional framework on the vertical and horizontal division of competences to address the growing EU’s democratic deficit. 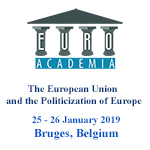 The paper also argues that growing political distortions and increasing politicization of the EU will lead to increasing fragmentation and division. Moreover, the paper emphasizes the role of efficient allocation of rule making and argues that EU should reinforce a) its political-global dimension; b) its common cultural heritage; and c) should combat aggressively destructive nationalism, isolationism and cultural introspection. Furthermore, while employing law and economics insights of the constitutionalism, the paper offers several, economically inspired, instrumental insights on current triggering politicization processes inside the EU and offers a set of recommendations for an optimal policy intervention.